I love the Smirks at the moment. They are so cool and cute, just as cute as Hello Kitty. A lot of my Trimmie friends on Trimcraft Forum are into them as well. I bought a decoupage pack of smirks from the Craft Show . . . . . Of course the girlie pack. Going to use them in a scrapbook for my friends daughter as well, i think she will like them alot. Might even make it into a funky birthday card. When i flicked through the pack, the 3 cute Smirks shopping caught my eye. I had a card making idea and I knew straight away what design to do. So I got straight down to work. I love the way the smirks have a distinct character even though they don’t have much facial feature, simple yet effective! I decoupaged the Smirks and mounted them onto pink card which i layered onto black and white polka dot paper. 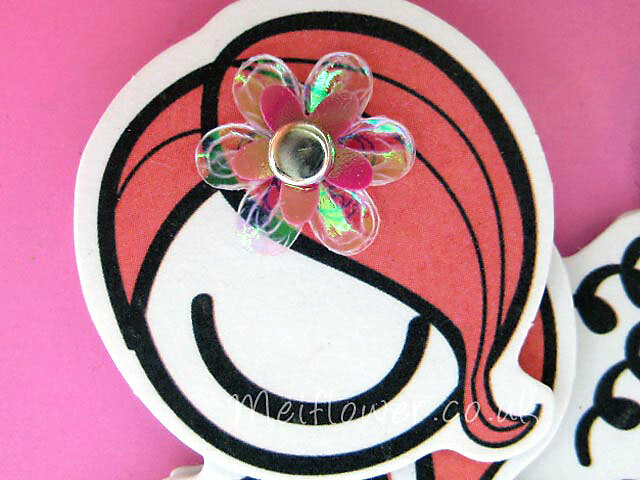 To give the Smirks abit of a glam look, i added sequin flowers onto their hair which is attached with silver brads. 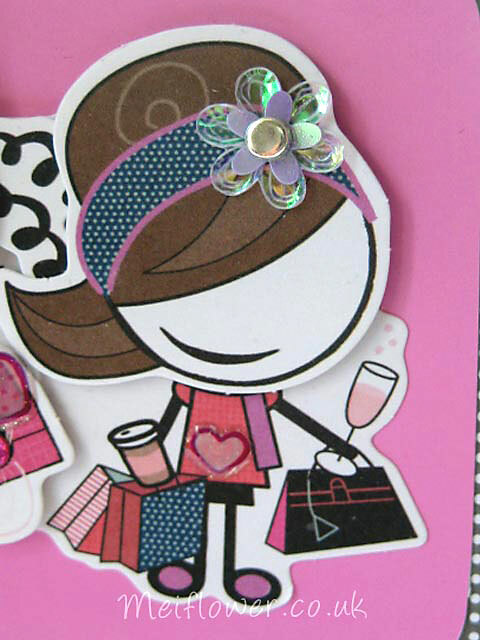 To finish of the card i added matching cute dress stickers along the base, to give the overall girlie card. This entry was posted on Tuesday, August 17th, 2010 at 4:24 pm	and is filed under Girly Cards. You can follow any responses to this entry through the RSS 2.0 feed. You can leave a response, or trackback from your own site.